Poor indoor air quality can not only be uncomfortable, causing residents to experience headaches, dry eyes and nasal congestion, but also can be unhealthy. According to the American Lung Association, poor indoor air quality can cause or contribute to the development of infections, lung cancer and chronic lung diseases, such as asthma. 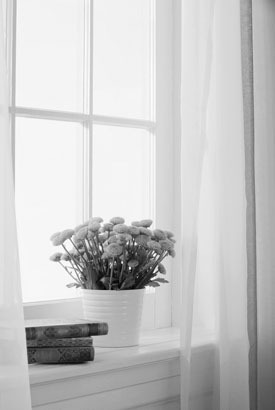 Though it’s not feasible or healthy to open windows when temperatures outside dip to near or below freezing, there are steps everyone can take to improve the indoor air quality in their homes. Add to your décor with plants. Plants provide both aesthetic and practical appeal to a home’s interior. Houseplants can clean and purify the air in a home, helping to remove formaldehyde, benzene and other toxins that can make indoor air unhealthy to breathe. Benzene is an irritant that can cause dizziness, headache, nausea, and blurred vision, among other side effects. Formaldehyde, which is often found in homes thanks to its widespread use in a range of products, can cause watery eyes, nausea and wheezing. Watch what you are lighting up. Many homeowners know that smoking indoors drastically reduces indoor air quality, putting even nonsmokers at heightened risk of developing various respiratory ailments. Homeowners concerned about the indoor air quality in their homes should ban smoking inside, no matter how low temperatures dip outside. In addition, homeowners with wood-burning stoves and fireplaces should be especially diligent maintaining these features, as they can release harmful soot and smoke if they are not taken care of. Some people may also be allergic to incense and scented candles, so keep a watchful eye on residents and guests whenever you light candles or sticks of incense. If any symptoms of allergies appear, avoid lighting any more candles or incense, waiting until you can open the windows if you want to light any again. Purchase an air purifier. Air purifiers are beneficial year-round, helping to remove allergens and particles from a home. åHigh-efficiency particulate air filters, known as HEPA filters, are extremely effective at removing airborne particulates from the air inside your home. Pay attention to pets. Like their owners, pets tend to spend more time indoors during the winter. That means more fur and pet dander, the skin flakes in an animal’s fur or hair that can trigger allergic reactions, is likely in your home during the winter than in the summer. To combat this, bathe your pets regularly in the winter, making sure to wash the animal’s bedding in hot water on a weekly basis as well. Open the windows when possible. Winter does not typically provide many opportunities to open the windows, but you might get a few chances to let some fresh air in through the windows during winter. Make the most of these opportunities, and when possible crack the windows when you’re cleaning so dust and other particles that kick up have a path outside of your home. Clean interior air should be a year-round priority, but homeowners may have to go the extra mile to keep their homes’ interior air clean when winter arrives.